1. Salaam, shalom, peace be with you. I’m Michael Riordon, a Canadian writer and documentary-maker. 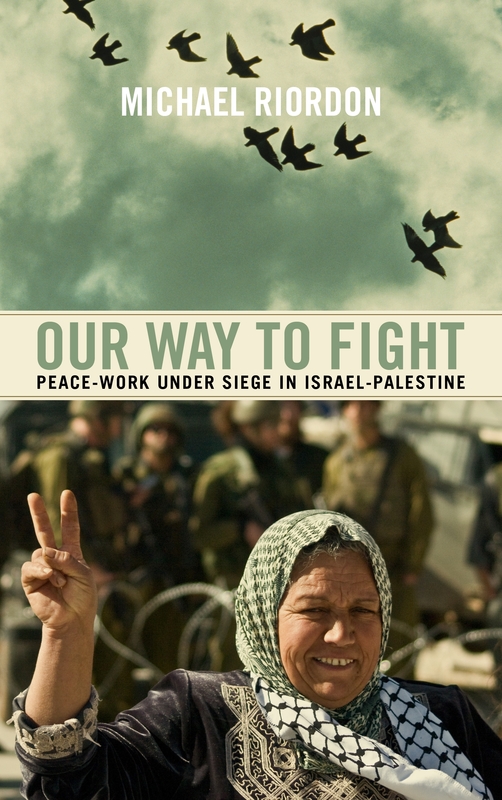 My forthcoming book, Our Way to Fight, explores the dangerous lives of non-violent activists working for peace, justice, and human rights on both sides of the wall in Israel-Palestine. The book will be released in January 2011 by Pluto Press (international) and Between the Lines (Canada), and in May 2011 by Chicago Review Press/Lawrence Hill Books (US). Writing Our Way to Fight is my way to fight. So is this blog. Through it I’ll share experiences, impressions, and thoughts connected to the book, also updates on people and organizations featured in it. I’ll post as circumstances warrant and allow. Soon I’ll add links to sites that I find especially valuable. Comments are welcome from people seeking a just peace in Palestine-Israel. A few ground-rules, borrowed from more experienced bloggers: no racist or sexist comments, no profanity or personal attacks, no misrepresentations of who you are, and no trolling. Other than that, let’s talk. Ofra suggests a smart café with an outdoor terrace in Kyriat Motzkin. After a broiling day, the Mediterranean air feels soft and light. Kyriat is Hebrew for town, though this one has blurred into a string of suburbs on the wide bay curving north from Haifa. My supper companions are an Israeli friend travelling with me to the Galilee, a former student of hers named Ofra, and Ofra’s son Uri, who at twenty-one has just completed his compulsory three years of military service. He’s taller than his mother, but somehow less substantial. In a t-shirt, shorts and flip-flops he looks twelve, though big for his age. She looks to be in her forties, with black hair pulled back, and dark eyes sparking out of a round face. The menu here is familiar from similar places in North America, the salads, pastas, burgers, even the carrot cake. The clientele is also familiar – young, casually stylish, tanned, sunglasses topping artfully chaotic hair. A security guard hovers near the entrance, with a black and yellow baton. I assume it’s a weapon, but when he skims it over flower boxes lining the fence, I recognize an electronic frisking device. He’s looking for bombs. Ofra wants my friend to help Uri get into Hebrew University in Jerusalem. My friend protests that she doesn’t have that kind of power, it will all come down to his marks. Ofra counters, “You have more power than I do.” Perhaps embarassed by this bargaining over his head, Uri turns his attention to the street. His father disappeared a few years ago, my friend told me earlier. Despite Ofra’s hard-earned degree in sociology, she can only find work as a secretary in a local law office, from which she supports the two of them. With her son, said my friend, Ofra is as fiercely protective as a mother lion. During the 2006 Israeli invasion of Lebanon, when Hezbollah rockets hit the Haifa region, people were urged to evacuate, and most did. Ofra refused. What if my son came home on leave, she argued, and no one was here to greet him? While the women chat in Hebrew, Uri and I manage in English. “Where will you go next?” he asks. “To the West Bank,” I reply. “Why not?” I reply carefully, wondering if this could get awkward. “Things are very bad there,” he says. “In what way?” I’m not so much naïve as careful. I smile. “I think that would mean more at your age than it does at mine.” I’ve heard often here that after their military service, many young Israeli men go to India to find or lose themselves, and for the cheap drugs. ‘Scratched,’ these young men are called in Israel, damaged. At least Turkey is closer. A little silence, we watch the traffic. A surprising number of bulky SUVs – I had hoped people here would be more sensible. Alert to any threat, the mother lion pounces. “He was actually preparing to re-enlist,” says Ofra. Uri rolls his eyes, shakes his head, but she will not be silenced. “I told him if he tried, I would go personally to the military and I would break some furniture, so they would think I was crazy and they would be afraid to accept him in case he was too.” The image so tickles me I’m tempted to laugh, but no one else shows a trace of smile. Thanks for this blog, Michael. I’m eager to read your book, learn your information and benefit from your insights about this most challenging and confounding situation. I’m guessing you’ve already seen the recent book, _Refusing to be Enemies: Palestinian and Israeli Nonviolent Resistance to the Israeli Occupation_ (by Maxine Kaufman-Lacusta, Ithaca Press pb, Reading, UK, 2010). Thanks for your continued work. Thanks for the reference. Seems to me all such works are attempts to expand the space for independent thought, compassion, a refusal to see The Other as enemy, and a sensible reading of history. There’s a compelling vignette – such a blend of the ordinary and the menacing – café salads and bomb searches. Thanks for this piece, Michael. I really look forward to following this blog and having the opportunity to really consider the reality of other people’s experience outside of our cozy, moss covered island. Good point. Though very beguiling, cozy islands can get a little claustrophobic, no? For someone who works on the upper west side of Manhattan, where conversations about these issues are complex, I welcome the vivid descriptiveness of the vignettes. I look forward to the book. thanks, Michael. Often in Israel people told me they didn’t believe that a just peace could happen in the Middle East without massive pressure from outside, primarily from Israel’s most powerful and faithful supporter, the US. So I hope that those conversations on the upper west side of Manhattan continue to become increasingly complicated.